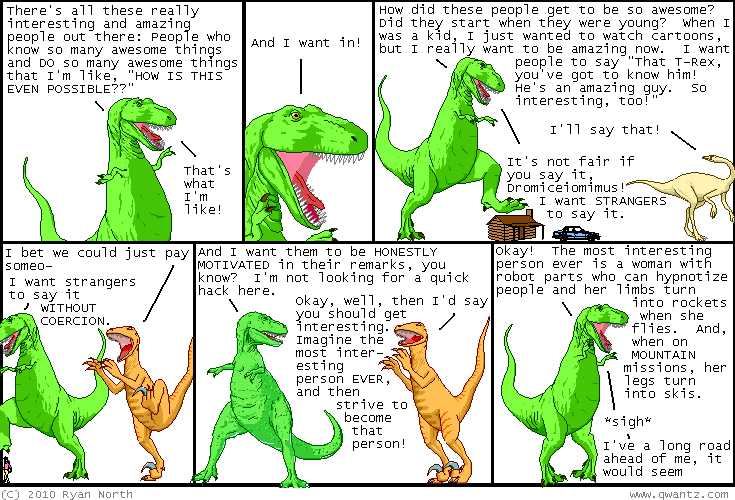 Dinosaur Comics - December 17th, 2010 - awesome fun times! Good friend Allene Chomyn is a finalist in the YouTube Symphony Orchestra! If you go and like her music, give her a vote so she can go to Sydney and play her violin for THE INTERNET. Vi Hart's Math Doodles are engrossing and charming and the one involving elephants has a TINY shout-out to one Mr. Tusks! Brawl in the Family is a comic I've been getting really into lately, and this one comic about Princess Peach being kidnapped is just about perfect, I've gotta say. One year ago today: oh, also it can't be something illegal. you're not allowed to rob a bank because a will told you to do it. "SOCIETY", am i right?